The dates of Pope Francis’ upcoming trip to the Holy Land are no accident. Pope Francis intends to visit from May 24 to 26, primarily to commemorate with Patriarch Bartholomew I of Constantinople the 50th anniversary of the meeting between Pope Paul VI and Patriarch Athenagoras in Jerusalem in January 1964. Two weeks before the new pope opened the second period of the Second Vatican Council on Sept. 29, 1963, he wrote an appunto, a private memorandum to himself, in which he expressed the hope to be a “papal pilgrim in the Holy Land.” One subordinate purpose was for him to have “a fraternal encounter with the various Christian denominations there.” In his address to the council on Dec. 4, 1963, however, this reason was absent when he shared his decision to make a “pious pilgrimage to the homeland of Jesus our Savior” in January. For some reason, he and his tight-lipped planning committee of five had not envisioned ecumenical meetings. Their sole preoccupation, it seems, was to visit Catholic communities at holy sites in Israel and in Jordanian East Jerusalem and the West Bank, and to negotiate with the two warring countries that were at each other’s throats. The pilgrimage had been the best kept secret in the Roman Curia, which has a reputation for being leaky. It was a complete surprise to Cardinal Augustin Bea, Msgr. 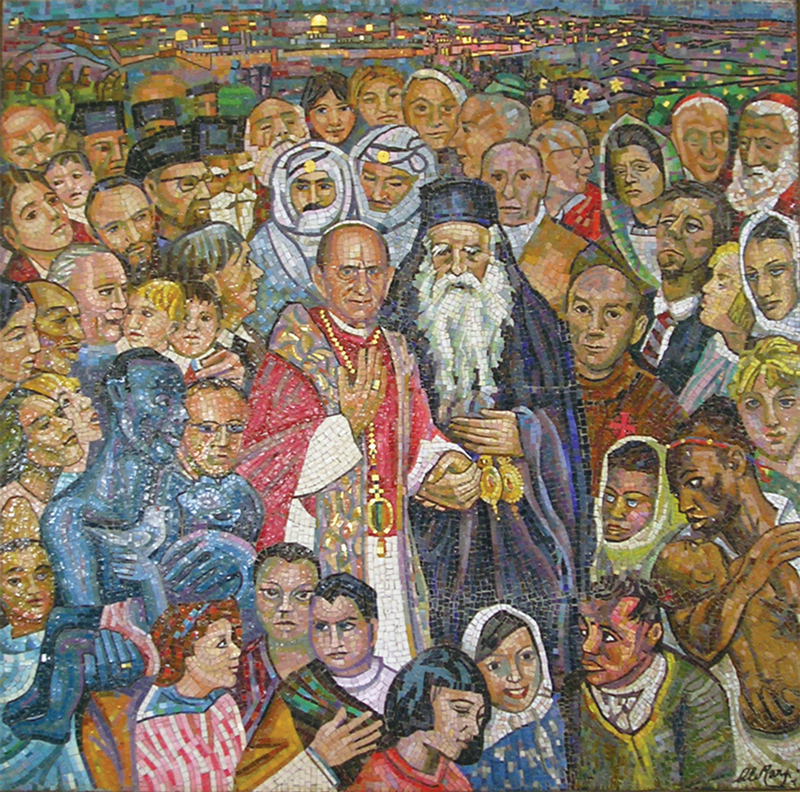 Johannes Willebrands and people on their staff in the Secretariat for Promoting Christian Unity, like Pierre Duprey of the Society of Missionaries of Africa, who until April 1963 had been the rector of the Melkite Saint Anne’s Seminary in Jerusalem, where he was quite familiar with the Christian leaders and their sensitive interchurch protocols for visiting heads of churches. Father Duprey quickly foresaw the possibility of Paul VI’s meeting with the Greek and Armenian patriarchs in Jerusalem, Benediktos I and Yeghishe Derderian. If the Holy See would not even propose the possibility to them, one could face an interchurch setback by a papal snub, a lack of courtesy no matter how unintentional. Cardinal Bea, Monsignor Willebrands and Father Duprey took the initiative. By that evening Pope Paul had in hand a memorandum. Before he could reflect and respond, a press communiqué on Dec. 6 from the patriarchate in Istanbul, Turkey, announced not only Athenagoras’s enthusiasm over the “historic decision” but also noted “it would be a work of divine Providence, if, on the occasion of this sacred pilgrimage of His Holiness, all the heads of the holy Churches of Christ, of the East and West, of the three confessional groupings, were to meet one another in the holy city of Sion.” The communiqué made an impulsive call for a world meeting, only a month away, of Christian leaders at the foot of Golgotha, next to the empty tomb and near to the Upper Room of Pentecost. Paul VI acted quickly. He approved Father Duprey, as an emissary of Cardinal Bea, to go immediately to Istanbul and to Jerusalem (Dec. 9-12, 1963). To Athenagoras, Father Duprey clarified that a grand meeting of heads of churches would be impossible, but, as he tactfully formulated: “The pope goes on pilgrimage to Jerusalem. If you would also be on pilgrimage to Jerusalem on these days, he would be most happy to meet you there.” Athenagoras responded with delight, and hoped that the heads of the other autonomous Greek Orthodox Churches would approve, or at least not object. He would consult them. The biggest question mark was Patriarch Benediktos of Jerusalem. According to the ancient protocol of the Council of Chalcedon in A.D. 451, he should first invite the patriarch of Constantinople; he should be the first to greet the bishop of Rome and patriarch of the West; and he should receive a reciprocal visit from Paul VI. Benediktos was strongly opposed to having Greek Orthodox observers at Vatican II. “They would directly and passively witness anti-Orthodox speeches and decisions,” he warned. He judged that the council included a proselytic intent to lure vulnerable Orthodox into the Catholic fold. Nevertheless, in Jerusalem Benediktos reluctantly assured Father Duprey that if Rome respected the protocols, he would cooperate. The Armenian patriarch was most favorable to meeting the pope, and so were heads of other churches in Jerusalem: the Oriental Orthodox Coptic, Ethiopian and Syrian churches and the Anglican. What helped facilitate the positive atmosphere of Father Duprey’s brief visits to them was that all, except the Greek Orthodox, had delegated observers to the first two periods of Vatican II. Within the next two weeks Athenagoras was receiving degrees of positive replies from the patriarchates of Alexandria, Antioch, Moscow, Serbia, Romania and Bulgaria. Antioch had one caution: Do not place even one foot in Israel. The consensus was that Athenagoras, as Patriarch Alexis I of Moscow insisted, represent the Church of Constantinople, not Orthodoxy as a whole. The only public opposition arose within the church in Greece. Metropolitan Chrysostomos II of Athens called the Athenagoras line “fatal” for Orthodox interests. He consented to an all-night prayer vigil on Mount Athos, “to preserve Orthodoxy from the consequences of this disastrous Jerusalem meeting.” The Greek government and most of the clergy and laity were positive. The prestigious theology faculties of Athens and Salonica gave wholehearted approval. Time was pressing. After Christmas an emissary of the Holy Synod of Constantinople, Metropolitan Athenagoras of Great Britain, came to Rome to work out “the protocol of reception.” (He had served as a bishop in the United States and Canada and as dean of the Holy Cross Greek Orthodox School of Theology in Brookline, Mass.) The patriarchate announced its approval on Dec. 31, 1963. Four days later, at dusk, the pope arrived in Jerusalem from Jordan. That evening, Benediktos greeted him at the headquarters of the Holy See delegation. Later Paul VI visited Benediktos at the nearby patriarchate residence atop the Mount of Olives. The next day, the pope greeted Athenagoras at the delegation headquarters, the first embrace of the apostolic sees of Rome and Constantinople—founded by the blood brothers St. Peter and St. Andrew—since Pope Eugenius IV and Patriarch Josephus II had met at the reunion Council of Florence in March 1438. Athenagoras called the meeting “the first glimmer of a blessed day when future generations will receive communion in the Holy Body and Blood of the Lord from the same chalice.” As a gift, the pope gave the patriarch a golden chalice. The next day, the feast of the Epiphany, Benediktos welcomed the pope at the entrance of his residence on the Mount of Olives. Inside was Athenagoras. They walked to the cathedral next door and co-led a common prayer service, which began with the embrace of fraternal peace. Thus Athenagoras initiated the first steps toward the healing of a 1,000-year-old schism, and Paul VI seized the opportunity—together, the beginning of the beginning. Great article. I remember a gesture with nine roses. Thank you Thomas. This article also appeared in print, under the headline "An Ecclesial Embrace," in the May 26-June 2, 2014 issue. Thomas F. Stransky, C.S.P., an original staff member of the Secretariat for Promoting Christian Unity, is emeritus rector of the Tantur Ecumenical Institute for Theological Studies in Jerusalem.